Gameloft ports smartphone hack and slash to console. 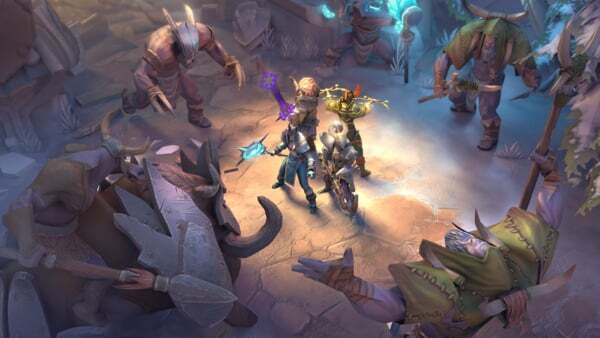 Gameloft and Laplace will release smartphone hack and slash Dungeon Hunter 5 on PlayStation 4 and PS Vita on July 13, the company announced. Pre-registration is now available via the PlayStation Store in Japan (PS4, PS Vita) and will run through July 18. Users who pre-register will receive an equipment treasure chest containing a powerful weapon. Join millions of Bounty Hunters in the latest opus of the most intense and immersive hack ‘n’ slash game ever released on mobile. Embark on a Single-Player Campaign through Five Realms and countless dungeons – While seeking vengeance against those who have forsaken you, embark on an immersive journey as our spirit-imbued hero through the five shattered realms, and become known as the most notorious Bounty Hunter of them all. Cooperative Gameplay – Hire your friends or other players as Allies to help you on your journey of vengeance and bounty hunting. Asynchronous Multiplayer – Customize your Stronghold with a large variety of creatures, manage and defend it, and raid opponents’ Strongholds to ravage their loot. Daily and Weekly Events – Daily dungeons will reward your demon-killing skills with unique materials to evolve and fuse your gear, while weekly Wanted Challenges will require you to get on top of the leaderboard to get the best rewards. Unrivaled Hack ‘n’ Slash Action – Discover how the animations and controls have been revamped to bring the most amazing combat moves and even more satisfying deaths. Superior Graphics – Dungeon Hunter V offers AAA graphics and intricate details to bring the game and story to life. Visit the game’s PlayStation Japan game page here.